The lone wolf salesperson doing their own marketing, lead generation, closing, and account management has been dying a slow death for years. Specialization, delegation, and outsourcing can help you increase your efficiency, but only if everyone is doing what they do best. Let’s look at a few of the steps in the sales process where you could improve efficiency and performance. Content Marketing: Inbound marketing and sales enablement using these resources is on the rise, because it’s working. Content marketing creates thought leadership for prospects to find you, and builds you and your company’s credibility when they Google your name. Those of you already active with a blog or writing eBooks know that content is a beast always needing to be fed. There’s a trend to simply outsource these tasks to professional writers. Hiring professionals to improve your writing is a good idea, but remember that a professional writer is not a subject matter expert in your field. You need to stay involved in the process, providing the best topics and the needs your clients are trying to solve. Appointment Setting: Once your marketing efforts have begun to generate leads, the next step is getting an appointment. Here again is an opportunity for increased efficiency, but there are a few things to watch out for here too when delegating or outsourcing. 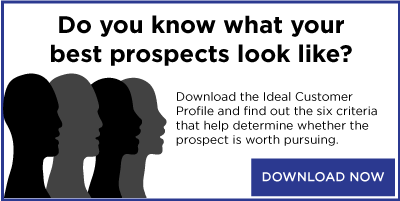 Mainly, what makes a good prospect? Your appointment setters don’t need the skills to conduct a full needs analysis, but they do need a good understanding of what makes a qualified lead. We use a process called the Ideal Customer Profile. Whatever you use, those who specialize in getting appointments, or at least those who are creating the lists, need to understand what meetings are worth your salespeople’s time. Account Management: Follow up and client services can eat up most of a typical salesperson’s day, which is why many companies are splitting the responsibilities between two teams. Agencies have had this model for years, and it’s becoming more common for in-house sales teams. While this role is rarely outsourced, the key here is that the Account Executive and Account Manager work in tandem. The Account Manager executing the solutions needs to have a full understanding about why and how the proposed solution will solve client needs. Specialization, delegation, and outsourcing will allow your salespeople more time to do what they should do best–needs analysis and creating buyable solutions­­­­­­. As long as you're are dividing up responsibilities strategically, you'll find that your people are able to accomplish a lot more when they can focus on the things they're best at.